Since 2007, genome-wide association studies (GWASs) have emerged as a powerful tool to identify disease-related genes for many common human disorders and other phenotypes . The National Human Genome Research Institute (NHGRI)  and the Centers for Disease Control and Prevention (CDC) both maintain online resources for tracking published GWASs. Data from the CDC HuGE Navigator [3, 4], an online, curated and searchable knowledge base in human genome epidemiology, show that the number of published GWASs grew from only a handful before 2007 to more than 300 as of mid-March 2009. 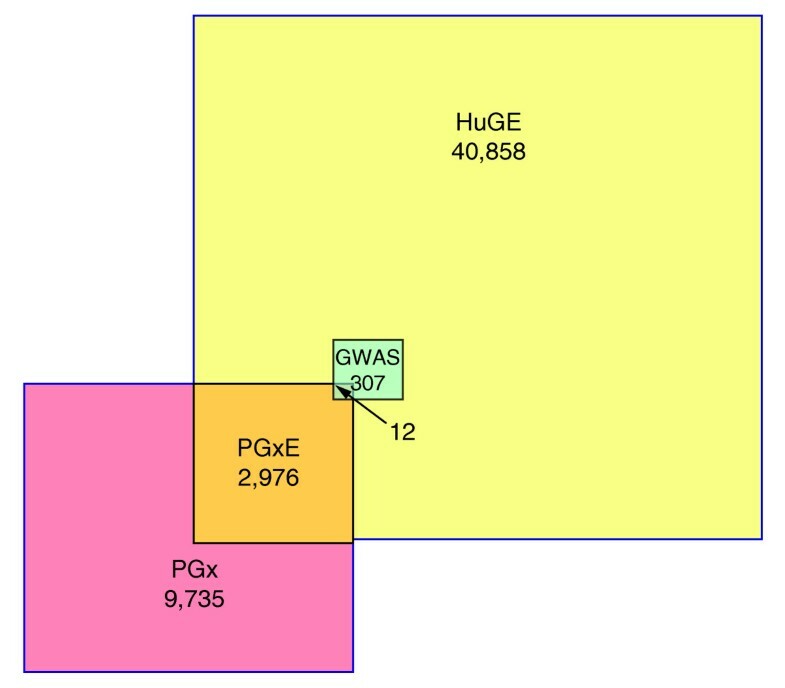 GWASs are characterized by the need for very large study populations and replication samples because the expected effect sizes are small and the expected number of false positive findings is large [5, 6]. Thus, although the cost of genotyping has decreased rapidly (and is expected to decrease further), GWASs remain a costly approach. Recently, the National Cancer Institute announced $96 million in grants over 4 years to support post-GWAS cancer studies to replicate and understand the biological basis of gene discoveries . These investments are in addition to the approximately $3 billion spent on the Human Genome Project , which was justified to the public largely on the basis of its potential to identify genetic risk factors leading to prevention and treatment of common diseases. The conventional GWAS approach is a hypothesis-free, systematic search of tagging single nucleotide polymorphisms (SNPs) across the genome to identify novel associations with common diseases. Although many such associations have been found and replicated, their effect sizes are modest at best (odds ratios mostly between 1.0 and 1.5) and they generally lack sufficient clinical sensitivity, specificity and predictive value to serve as risk or screening markers . Furthermore, in the absence of contextual information - such as potential functional implications at the molecular level, influence on physiologic processes or potential environmental interactions - these associations provide only a starting point for further research . Pharmacogenomics has often been represented as the leading edge in translating human genomic research for clinical practice, creating the basis for personalized medicine [11, 12]. It examines inter-individual variation in drug effects as a function of genetic variation by integrating epidemiological, genetic, pharmacological and clinical measurements. Results of the 12 pharmacogenomics GWASs published so far are summarized in a recent review by Crowley et al. , as well as in the NHGRI GWAS catalog . Six GWASs evaluated the association of genetic variation with drug efficacy, five evaluated adverse effects, and one examined a dose-response relationship (warfarin) . The GWAS approach has succeeded in discovering new associations with adverse drug effects, even though the biological mechanisms may be obscure. An example is the recent identification of a common variant in the SCLO1B1 gene that markedly increases the risk of statin-induced myopathy (odds ratio: 4.7-61.1, P = 4.1 × 10-9) . The investigators estimated that 60% of incident myopathy could be attributed to the newly identified variant. GWASs have also found genetic variants associated with individual responses to drugs, including analgesics and chemotherapeutic agents [15, 16]. GWASs have been recognized as an important approach for uncovering polymorphisms accounting for individual differences in drug efficacy and drug safety . A vast reservoir of observational studies and randomized clinical trials (RCTs) - completed, ongoing or planned - provides a largely untapped resource for pharmacogenomic studies of drug safety and efficacy. In particular, RCTs allow for precise measurement of drug exposure and consistent ascertainment of phenotype; randomization produces unbiased treatment assignments and helps balance unmeasured confounding factors . Performing GWASs within clinical trials, in which more potentially interacting variables can be identified, measured and controlled, improves efficiency. Khoury and Wacholder recently stressed that effects measured in GWASs will be correct only when gene-environment interactions are taken into account ; pharmacogenomic studies examine gene-environment interactions by definition. GWASs in pharmacogenomics also present challenges. So far, most such studies have included far fewer participants (average approximately 200) than the very large sample sizes typical of GWASs of common diseases . Nevertheless, even small pharmacogenomics GWASs have been successful in identifying robust associations because reducing variability in the definition and ascertainment of exposure and outcome increases their power to detect clinically meaningful effects. Nevertheless, larger studies will be required to detect smaller or less common effects. The absolute cost of GWASs in pharmacogenomics remains as high as in other fields, but in the context of drug RCTs and observational studies for side effects, the marginal cost of genotyping is small: as Roses recently pointed out , the entire investment in DNA sample collection and genotyping up to now is only a small fraction of the currently estimated cost to develop a single drug. At present, investment in GWASs, pharmacogenomics and clinical trials of drug safety and efficacy are not coordinated. From 2001 to mid-March 2009, HuGE Navigator identified 2,967 articles on pharmacogenomics, of which only 299 (10%) were clinical trials and 12 (0.4%) were GWASs; these 12 articles accounted for just 4% of all GWASs  (Figure 1). A coordinated approach to GWASs in RCTs could lead to more efficient pharmacogenomic research. A first step would be to collect appropriate biological samples from all clinical trial participants and obtain their informed consent for future pharmacogenomic research studies. Overlap of human genome epidemiology (HuGE), pharmacogenomics (PGx) and genome-wide association study (GWAS) literature, from 2001 to mid-March 2009. Numbers indicate the results obtained when PubMed and HuGE Navigator publication databases were searched by the following terms: PubMed: "pharmacogenet* OR pharmacogenom*" (PGx). HuGE Navigator (total publications 40,858): "pharmacogenomics" (PGxE); "GWAS" (GWAS). Searches performed on 17 March 2009. Areas are not to scale. Many drug adverse effects are rare, coming to light only after a drug becomes available for widespread use . Clinical trial participants are a key reference population for subsequent investigation of adverse effects in case-control GWASs. In addition, observational studies built on practice-based settings (such as the health maintenance organization (HMO) research network [22, 23]) can provide clues to adverse drug effects and differences in effectiveness in 'real' world settings, outside the restricted conditions of RCTs. So far, only two GWASs have been conducted in drug clinical trials; each of these studies provides relevant insights for future research. A study of electrocardiographic abnormalities during iloperidone treatment of schizophrenia  illustrated the feasibility of performing GWASs in a phase III clinical trial evaluating the efficacy, safety and tolerability of a novel drug. A report on statin-related myopathy  demonstrated the efficiency of performing a nested case-control GWAS within a clinical trial. Given their efficiency and potential for leading to useful clinical medicine and public health applications, it seems surprising that so few GWASs have been done in the field of pharmacogenomics, especially within clinical trials. The incentives for conducting such studies deserve closer evaluation. The US Food and Drug Administration has encouraged clinical trial sponsors to submit pharmacogenomic data, including GWASs, on a voluntary basis . The National Institutes of Health has recently established funding priorities and requirements for GWASs in government-funded clinical trials . In parallel, the prevailing method of reporting results - typically limited to novel 'GWAS hits' or to one candidate gene at a time - should be revisited. Recently, the investigators in the CATIE trial of antipsychotic therapy in schizophrenia demonstrated the feasibility of sharing complete pharmacogenomic study data and discussed the utility of this approach for the scientific community . Comprehensive reporting of GWAS results in standardized formats will enhance opportunities for evidence synthesis through meta-analysis . Thus, GWASs can not only identify novel associations for further study, but can help counter the selective reporting and pursuit of false positive findings that may occur when pharmacogenomic studies are limited to candidate genes . The past few years have seen a flurry of GWAS findings, but few have found their way to clinical application. Pharmacogenomics studies, especially clinical trials, provide a promising setting for the GWAS approach, which has already shown success in identifying key genetic determinants of drug efficacy and adverse effects. Despite the potential for effective translation of such findings, few GWASs have been conducted in pharmacogenomics. The incentives for conducting such studies deserve closer evaluation. We thank Wei Yu and Mindy Clyne for development and curation of the HuGE Navigator knowledge base. This research was supported in part by the appointment of IG to the Research Participation Program at the Centers for Disease Control and Prevention administered by the Oak Ridge Institute for Science and Education through an interagency agreement between the US Department of Energy and the CDC. The findings and conclusions in this report are those of the authors and do not necessarily represent the official position of the CDC. IG, MG, and MJK were involved in drafting the manuscript and have given final approval of the version to be published.